SAME KIND OF DIFFERENT AS ME, the first joint film partnership between Paramount Pictures and Pure Flix, is releasing in theaters on October 20, 2017. The film stars Academy Award nominee Greg Kinnear, Academy Award winner Renee Zellweger, Academy Award nominee Djimon Hounsou, and Academy Award winner Jon Voight. In honor of the film’s message that acts of kindness can make a powerful difference, Pure Flix created an initiative for regional organizations around the country to host red carpet screening events. On October 18, 126 local red carpet events (resulting in sales of 75,000 tickets and showings on 410 screens) took place to benefit local communities and shelters where attendees got a first viewing of the film and were reminded they can make a difference in their communities through their own acts of kindness. Pure Flix COO Steve Fedyski reiterates the importance of such events. “These red carpet events are a simple way to honor the spirit of this incredible true story of Hall’s life and work, and the film is a natural extension of that. It is impossible to imagine releasing this movie without raising awareness for, and helping, the communities it portrays,” says Fedyski. In the film, and in real life, Ron and Deborah Hall discovered a renewed sense of purpose when they began volunteering at a local mission in Fort Worth, Texas. But their lives changed forever when they became friends with a homeless man named Denver Moore, played by Djimon Hounsou in the movie. The story turns on this unlikely friendship, and the numerous lives changed for the better because of it. Over the years, Ron Hall and Denver Moore visited more than 200 shelters across America to help raise an estimated $85 million for the homeless. Today, Ron continues the legacy by sharing their miraculous story through speaking engagements, fundraisers, and partnerships with various organizations at missions, universities, and churches. 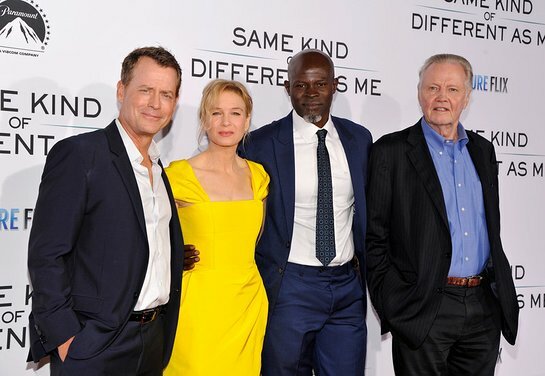 SAME KIND OF DIFFERENT AS ME is based on the New York Times best-seller of the same name and recounts the inspiring true story of a successful businessman with a broken marriage, an emotionally scarred homeless man with sensitivity beyond his circumstances, and the woman who helped them experience a bond that crossed the socioeconomic divides that could have separated them. SAME KIND OF DIFFERENT AS ME, rated PG-13 for thematic elements including some violence and language, is directed by Michael Carney in his feature-film debut from a script he co-wrote with Alexander Foard and Ron Hall. It is produced by Cale Boyter, Mary Parent, Ron Hall, Stephen Johnston and Darren Moorman. For more information visit www.samekindofdifferentasmemovie.com.